This blog is about the political struggle I am engaging in Singapore. The title "Singapore Alternatives" is chosen because my only political dream is to build a true alternative in Singapore. Alternative to PAP government, of course. As the Alternative, the political party must be able to have the visions and policy insights to lead Singapore. I will write on various policy views and personal beliefs that I think is crucial in building up the Alternative. All constructive comments are welcome. Recently there is an article and comments which try to mock or belittle Mr Tan Kin Lian in bringing up an idea of improving the cash payment system for bus company. It is quite typical of Singaporeans, really. They don't really understand the problem and how system could be improved before they tried to belittle others. Mr Tan had put up a suggestion that all cash payment for bus ride should be fixed at a price (let's say $2 or $3) and that will keep it simple. I understand where Mr Tan is coming from but not many of his detractors. First thing you got to ask yourself, have you tried to take a bus by paying cash before? If so, do you always get your bus fare right all the time without the need to ask the driver? Most of you will not know how much and some of you would think the fare is the same as the EZ-Link card fare! This is the problem Mr Tan tries to address. Application of Technology may not be always good. The principle I used to assess whether an application of Technology is excellent, good or bad or flawed is to look at KISS. What is KISS? For example, the EZ-Link card is a good system, though not the Excellent system. Why? Because it does not address the issue of people forgetting to tap while exiting the bus. It does not expand to other usage like replacing the cash card system and for retail purpose. This is only passable with a Grade C as compared to Hong Kong's Octopus Card, in my view. As for the Cash payment system for the buses here, it is utterly complex and it is neither efficient nor productive. If a commuter does not know his fare, he will ask the driver. This will take a couple of minutes normally. And for this system, the bus company has to employ additional supervisors to do spot checks on buses just because of the relatively fewer commuters who use cash payment! Hong Kong system is something worth looking at. Although Hong Kong's system does not differentiate fare based on whether you use Octopus Card or cash, or that it will give discount when you change bus or train (this is part of the strength of Singapore's system), but it is simple, neat and clean. The bus fare is based on a stepping down system. When you take the bus from the terminal, it will charge you a flat fare of let's say $7.80. At the next section (maybe a few bus stops away), the fare may drop to $6, etc. The beauty of this system is that it is KISS. When you board the bus, if you use Octopus Card, you only tap once when you board and bus fare deducted. You don't need to worry on whether you would forget to tap when you alight the bus. If you use cash for payment, there will be LED display panel to show how much you should pay. The bus driver will just make sure you pay the right fare. No tickets needed or given! End of transaction. Is there any technology applied here? Yes. The Octopus Card system as well as the auto-fare calculation display panel. And you don't need bus company to send people going around to check whether you have paid the fare or not! Singapore could adopt the part of cash payment system. If you are paying cash, then be prepared to pay more or just equal if you are taking full ride to the terminal end. The fare will be calculated based on maximum distance trip. For example, if you take a bus from the start terminal, you will pay the full fare from Start to End Terminal in cash, regardless of where you will be alighting along the way. The LED display panel will show that fare. 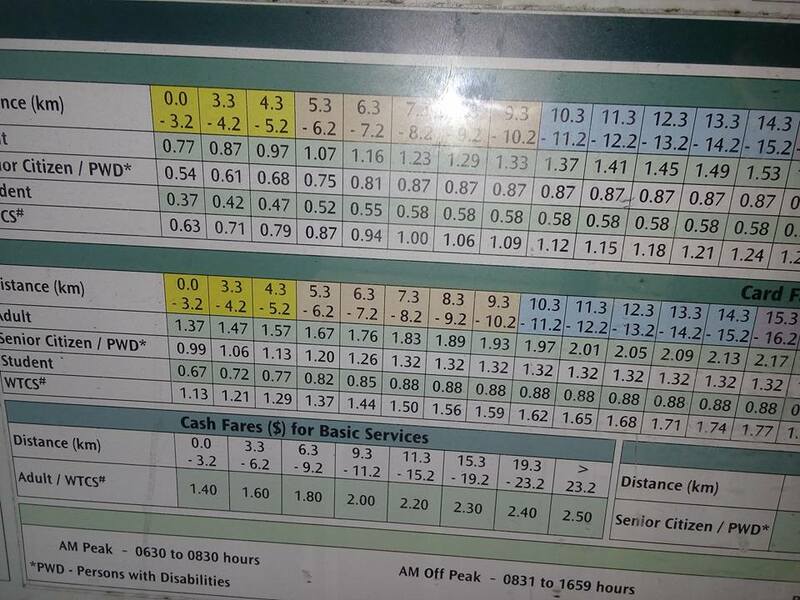 Even if you take the bus at mid-point, the fare calculated will be from mid-point to End Terminal, regardless of where you want to alight. For this system, there will not be a need of issuing tickets nor sending bus conductors to do spot checks (save cost to the bus companies). The commuters will have fare clearly stated to them when they board the bus, don't need to waste time of asking the bus drivers and having the drivers to start figuring out the actual fare. You do not need to be Techie to use such system like searching through internet or phone apps, just like EZ-Link card. It is basically Simple and Stupid Idiot Proof system. It improves productivity, effectiveness and efficiency. Quite easy to implement as well. The main problem with Singaporeans is that they do not observe and learn much things about other systems in other places when they travel. Most Singaporeans would think our system is the best around the world without knowing how fast the other cities had progressed. I have known Kin Lian Tan for quite some time now and I know he is always trying to comment on how things in Singapore can be improved. In fact, his consistency in doing so just demonstrates he genuinely care for Singapore. Try asking Tony Tan to take the public transport, or even board the bus and see whether he knows how to use that EZ-Link card! Or simply ask the standard questions to all President-wannbe, how much is the bus fare in cash for our system! See how many of them could really answer without googling for it! Thus, I find it extremely disappointing in some Singaporeans who are so myopic and vindictive, blinded by their own prejudice, emotions and misplaced "loyalty" to see the BIGGER context of things. Other than Tan Kin Lian and maybe Tan Jee Say Tan, had any other President candidates contributed their ideas, time and effort in trying to improve Singapore? Just for illustration. The current cash payment system is horrendous. For short trips, you will pay almost DOUBLE of the card payment. For my system, it may be more or lesser depends on where you board and alight the bus. But for long distance travel, you will definitely pay lesser than the current system by paying cash. At least TWO PAP Ministers (Khaw Boon Wan & Lawrence Wong) have confirmed my point about the HDB 99 Year Lease being ZERO in value when the lease expired. This is an important critical fact that most Singaporeans have ignored for decades and despite of such reality, Singaporeans are still pumping huge amount of money willingly into HDB resale market which in turn, pushes up the new BTO HDB flats! This is one of the important reason why I would insist a TOTAL de-link of new BTO prices from resale market prices because it doesn't make sense at all. There are two broad ways of analysing the impacts and implications of this HDB 99 Years Leasehold issue. i.e. Macro Level vs Micro Level. Minister of National Development Lawrence Wong has recently flip-flopped over this HDB 99 year lease issue. First he admitted that when the lease is up, the HDB flat will have ZERO value and the "Leasers" (which Singaporeans always thought themselves to be "owners") will have to return the HDB flat to HDB and HDB has to return the land to SLA. But a couple of days later, in a dismay effort to cushion off the shocking effect on Singaporeans, Lawrence Wong came up with the notion that "HDB is a good store of value"! How could HDB flats which will depreciate and end up with ZERO value eventually to be a "good store of value"? That's totally nonsensical and illogical. There are many people and well known bloggers who have written on this topic and got many points right but miss a few critical points altogether. The former MND Minister Mah Bow Tan and up to now, Lawrence Wong, keeps talking about "Monetize HDB flat for Retirement", which is a totally flawed concept. I would have debated against Mah Bow Tan on this point LIVE on TV if he had dared to accept my challenge back in GE 2011 and I would have shot straight into his face with this 99 Year Leasehold issue of HDB and ask him how could it be possible to "Monetize HDB for Retirement" when most Singaporeans would face great difficulty in selling off their HDB flats when it passed the 50 year lease mark? Yes, the Time Bomb doesn't start to blow up with it reaches 99 Year but rather, when your flat reaches 50 year old. How many people are able to fork out over $3000 or even $2000 monthly to pay their mortgage for your 50 year old resale HDB flat? Or even if they could afford to, why would they want to buy your flat knowing that it is going to depreciate further and become ZERO in value in the next few decades? I believe the projections by the chart above (by Soh Yun Yee) is just too overly optimistic. HDB flats which pass that 50 year mark, would have suffered a steep fall in value thereafter! And look at it this way, for HDB flats, you cannot own TWO HDB flats at the time! Thus it means that if your parents passed away and left you their HDB flat while you still own a HDB flat, you will have no choice but to sell one away! i.e. either you sell off your own HDB flat or your parent's HDB flat! 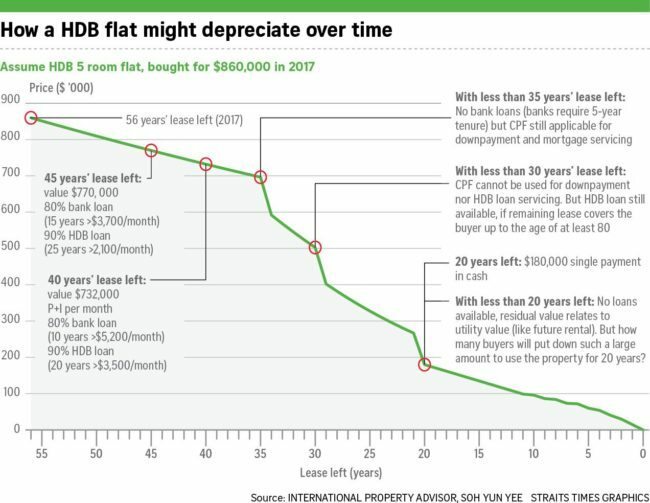 Many Singaporeans will face this problem and with the upcoming silver bombing due to aging population, the resale market will be flooded with lots of old HDB flats with lease less than 60 years or 50 years while demand will be extremely small! Thus, what is the impact? A major collapse of resale market for HDB flats which have less than 50 years lease! This is the FUNDAMENTAL difference between a Private Property vs HDB flats with the same 99 year lease. For Private Property, you could still keep that property which you inherit from your parents and rent it out, really "monetize" it, but for HDB? You can't. For Private Property, there is a good chance for you to seek private en-block and monetize it fully, renewing the lease again when you do so. But for HDB? You will have to wait for HDB to initiate that SERS which is basically non-existence now because it is not PROFITABLE for HDB to do so! This is the reason why only 4% of HDB flats had gotten SERS and Minister Lawrence Wong has "hinted" or rather "WARNED" that Singaporeans should not expect their HDB flats to enjoy SERS! There are 1 million HDB flats, of which 70,000 or 7 per cent are over 40 years old. About 280,000 units are 30 to 40 years old. That’s one in three flats 30 years or older. But what is exactly the implication? It means that by 2020, the problems of 99 Years Lease will start to surface. Yes just 3 more years. Most HDB flats were built in late 1960s, 1970s to 1980s. From 1970s to 1980s, we have housing estates like Tiong Bahru, Tanglin Halt, Queenstown, Bukit Merah, Bukit Ho Swee, Toa Payoh, Hougang (old Hougang), Ang Mo Kio, Bedok, Jurong etc built within this period. It would also mean that many flats from these towns will face the problems when they cross 50 years lease, starting from 2020 (1970 to 2020, it is 50 years)! It also means that if PAP government just stop doing SERS or do it at extremely slow rate, when the lease expired for all these HDB flats in these towns, where are these Singaporeans going to find another HDB flat to live in? Where to find even HALF the size of these towns (assuming flats will be built double the height of the old ones) add together to house them? By 2060, we will start seeing these problems exploding. On the other hand, do you really think your HDB flats could last 99 years? I am doubtful that most HDB flats could even last 70 years while some could not even last 50 years due to poor quality of the material used during the late 1970s to 1980s construction boom. HDB upgrading could only solve parts of these massive problems. Some old HDB flats even have obvious cracks and problems of concretes falling off that walls before they reach 50 years old! 99 Years Lease HDB flats are good policy deal IF AND ONLY IF the flats are kept at extremely low cost and there are continuous efforts to en-block and rebuild them starting from 30 years old onwards. At least 50% of the flats built from 1960s to 1980s should be SERS or en-block and rebuilt before the 99 years lease expired. This will ensure we have enough land for cross generations usage and cater for gradual population growth. It is not meant to be "Asset Enhancement" nor "Monetize for Retirement" but PURELY cater to the housing needs of Singaporeans of ALL GENERATIONS. Unfortunately PAP has strayed too far away from its initial ideology just to insert all means to milk Singaporeans while kicking the cans of problems down the generations instead of maintaining a good balance in providing for the critical basic needs of Singaporeans. I would not mind to replace my 99 years lease HDB flats with another one when it is near expiry if I have bought my first HDB flat CHEAP at cost plus and continue to buy my second replacement flat CHEAP at cost plus as well! But the crazy Asset Enhancement Scheme introduced by PAP government during Goh Chok Tong's era has really screwed us up badly with the poison of greed to entice Singaporeans to use more of their CPF funds to pump up the HDB flats while sold the FALSE dream of forever "Enhanced" value of their HDB flats so that they could "Monetize their HDB Flats for Retirement"! It has mixed up and over-drawn, over-stressed our CPF which should be strictly for our retirement needs! Singaporeans are blinded by the poison of greed of short term gain in buying and selling their HDB flats in one or two generations, but they have unknowingly, sold out their own retirement plan and their future generations' welfare by falling for such poisonous enticement. TOTD: Are We Too Lenient to People Who Misappropriate Public Funds? While Kong Hee has expressed "disappointment" over his conviction, many more Singaporeans were disappointed or even angry that he and his gang get their sentences halved! Apparently the sentences meted out by the judges in reduction of their sentences by half, are totally out of expectation and out of sync with public sentiments. While we expect the court to be independent from "populist" sentiments as well as any other interference but to have a judgement which is totally in reverse of public expectation would create a lot of unnecessary speculations and distrust of our judiciary. It is of utmost important for the court to publicize and lay out the basis of their judgement and try to convince the public as well as the legal profession that their judgement is right with legal basis in granting a slash of half the initial jail terms meted out by the High Court. It is an important case which may have dire consequences for future similar cases as a precedence. In contrast to the previous cases of Mingyi monk who was sentenced to jail of 10 months which was reduced to 6 months later for a the $50K illegal loan a close aide along with forgery of documents as well as TT Durai NKF case which he was sentenced to 3 months jail term for forging invoices, this case involves millions and far more complex financial arrangement. in channeling funds to benefit the spouse's singing career, an immediate family member, of Kong Hee. These three cases would become important case study for the law school and the legal argument should be properly set out. Although in the CHC case, the sentences are seemingly relatively more severe than the previous two cases, but it begs the question of whether our court or legal system is just too lenient to people who misappropriate public funds. Misappropriation of public funds as compared to private funds should be of more serious consequences as it involves public trust in public institutions. However, these three cases have somehow gave the public the impression or mis-perception that misappropriation of public funds is of lesser consequences to those found guilty of CBT in private companies. As the saying goes, Justice needs to be done and seen to be done as well. The disparity between public expectation and the sentences meted out by our court may not be a good sign for Singapore and it needs to be resolved asap. Mountain Climbing not for 12 year old kids! What's Wrong With Our Education? NKF SAGA III: Transparency & Accountability? Where Are The National Flags?